Hello Friends! I hope you are doing well. 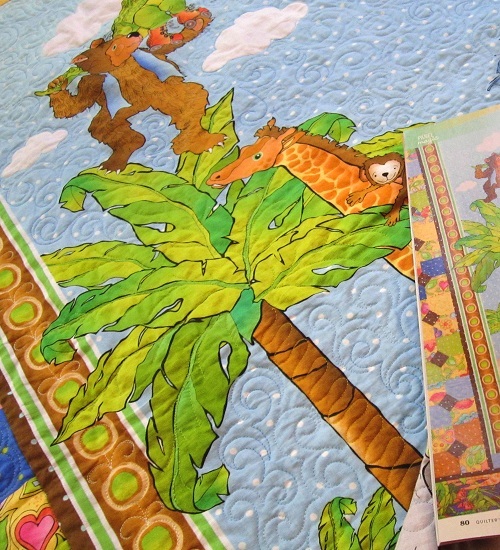 I am sharing with you today another recently featured quilt of mine that has been claimed by Miss Baby – my “A Tale as Tall as a Tree” quilt in Quilter’s World‘s October 2012. 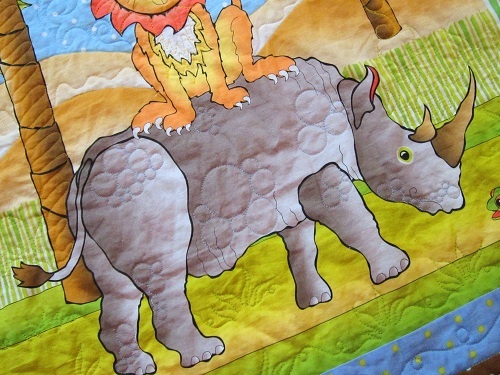 She calls it her Safari quilt. So far it has been used during naptime as a blanket, as well as a make-shift tent. I feel like this is the “All Creatures Great and Small” quilt in our family. This quilt project is actually a “dressed up” panel quilt using pieced blocks to frame the focal panel from RJR Fabrics‘ Silly Suggestions for Kids collection. This collection also has a more girly panel besides the animal panel. The fabrics are current as of this posting. 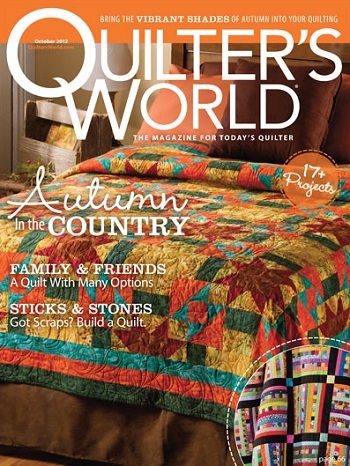 You might find them at your local quilt shops, if not, definitely on-line. For some reason, I am in love with these bow tie blocks, especially the tan ones. That tan polka dot fabric doesn’t seem to be a common one. The ease of constructing a panel quilt makes it highly highly conducive for practicing quilting. I love making panel quilts because that means I can get to the quilting part quicker! Quilting on this quilt was done using Aurifil‘s Mako 50 Cotton threads over Hobbs‘ Tuscany Silk batting. And zooming in, you can see the little touches I added to the panel, giving personality to the animals and their surroundings. See the differences between the before and after pictures. 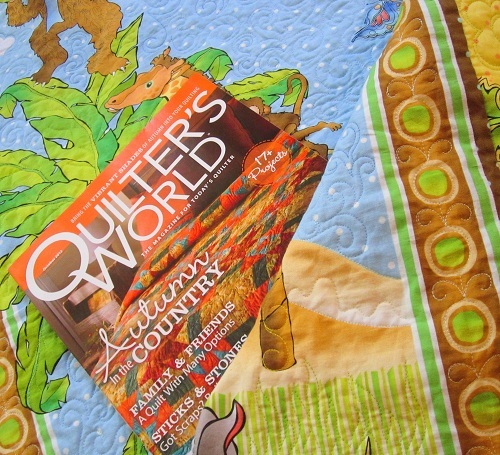 Here is a parting shot of the quilt to wish you a lovely day! Alrightie, I have GOT to run. I am not quite sure where my time has gone this week. If all things go well, I will be doing my follow-up post on “So how would you quilt this?” tomorrow. I am hopeful I would have a bit more time this weekend for me to visit you back. Hugs to you all! 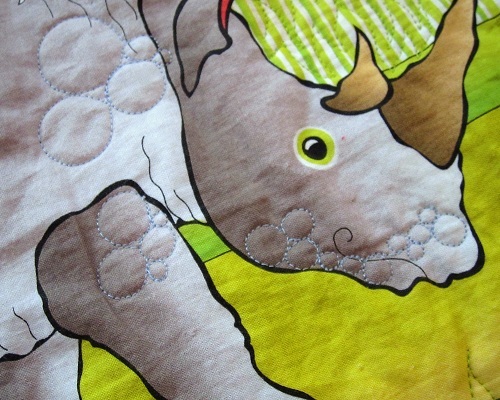 This entry was posted in Quilt Pattern, Quilting, Quilts & Projects: Published, Quilts: Pieced and tagged Animal Quilt, Panel Quilt, Quilter's World October 2012, RJR Silly Suggestions for Kids fabric collection, Wendy Sheppard Designs. Bookmark the permalink. I love your quilt! The details on the animals really make it for me. I have never tried a panel, but would be up for it. Thanks for sharing with us. As always, you inspire us. Perfect quilting! I’ve used panels before and think they’re great! There’s lots of options to spice them up and still make them unique. 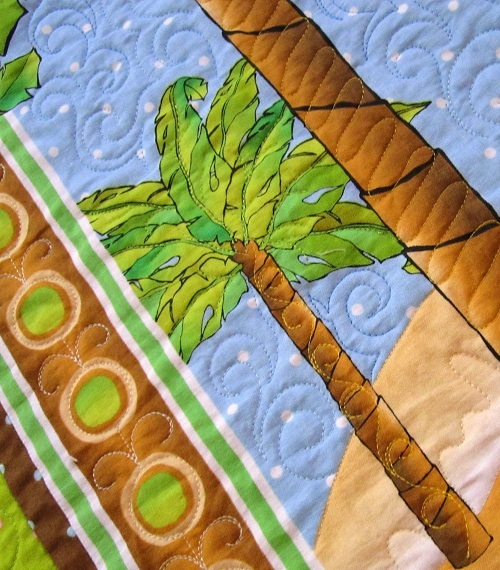 Hi Wendy: I would definitely like to see a quilt along w/panels. I have been using panels as practice pieces for several years and then donating them to kids charities. I also enjoy taking a panel apart and “rearranging” it. I recently did that with a half yard of victorian fans. I cut them apart and redid them with an alternate block (5″) sent on the diagonal. There are so many things you can do with panels. Love your quilt. Very creative indeed!! 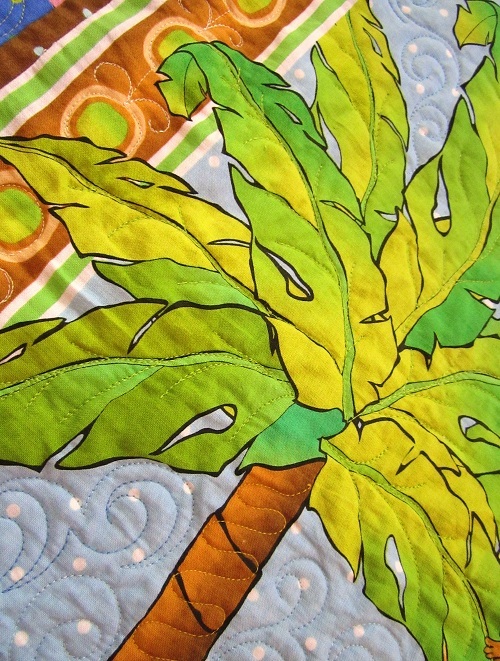 You have taken this quilt panel to a whole new level with your quilting. I love it! Hi, as always a cute quilt with lots of ideas! I like the flowers on the bow-ties. I’ve used panels for my grandsons when they were small, good way to get used to free motion & BSR just by tracing around them.Have a great day, play with Miss Baby lots. What a fun quilt! I like those bow-ties, too! Yes, I’ve used panels for grandbaby quilt centers, and have a couple more waiting to have borders added (love your bow-tie blocks) and quilted. 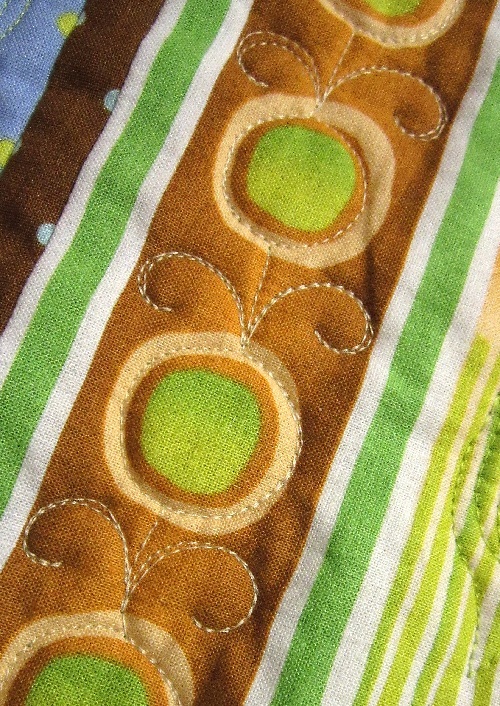 My first-ever FMQ quilt was a vintage “cheater” panel, which I think may have also been the subject of my first-ever blog post. I do like panels, even with the challenges they present with not being printed squarely on the fabric – have you ever had one that was? I did do one panel project, but never got past the top…surprise…No That would be a great way to practice quilting. I like panel quilts although I haven’t done that many. But, you are right. It opens up a lot more time for quilting. Thanks for the insight. I’ve gotten a couple of this panel and was planning to donate them to our annual fundraiser. But I’ll be doing just a plain border. I love your version of the border and I’ll use that idea, with your permission, of course, for one of my quilts. Can hardly wait for your blog tomorrow! Yes, yes, yes to the panel quilt-a-long! I think I would enjoy a panel quilt-along! Some quilters thought panels were the “poor kissing cousins” of quilting, its sad that some couldn’t see beyond just finishing the edge with binding and not anything else. I love all your quilting and instructions, so a quilt a long would be great. Panels are always great for beginners or those that want to practice, as you generally have not invested as much time/energy/materials as a pieced or appliquéd quilt top. thanks for all you share! What a really cute panel quilt Wendy. The print design and colors are beautiful. And, your FMQ really looks great with it too, as always. 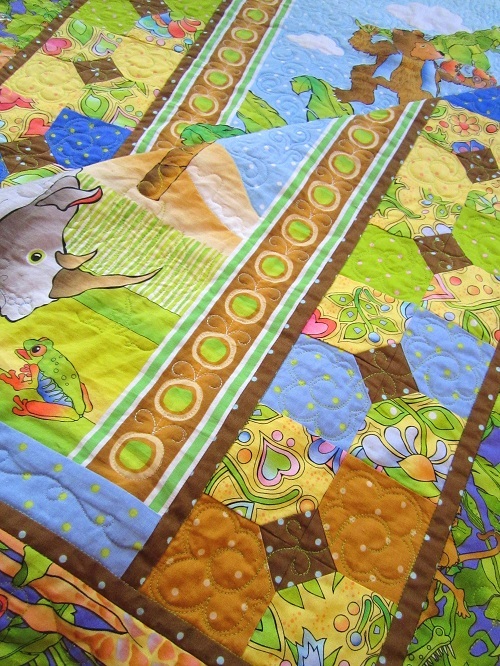 I can see why Miss Baby loves it and calls it her Safari Quilt. Just delightful. I do enjoy making panel quilts, especially when a panel catches my eye. 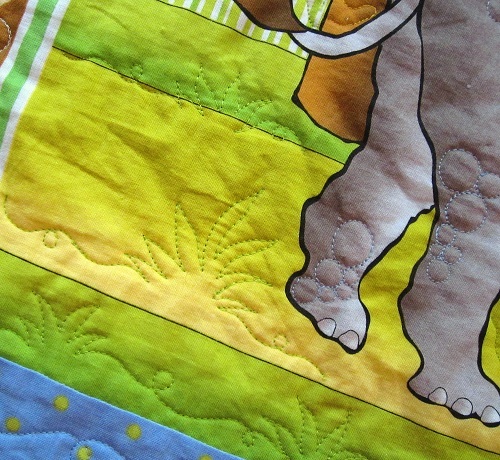 They are also a great source for quilters to practice their FMQ. And, I’ve found them to be very popular at fundraisers, with great ROI for those that like to make quilts to help raise money for good causes. This one would definitely be a big hit at a fundraiser too! I have a panel quilt that I added a hourglass block border to, and need to get it layered and quilted. I’m planning on adding details to the panel, so your post came in handy! Thanks for the ideas and inspiration. LOVE your work. 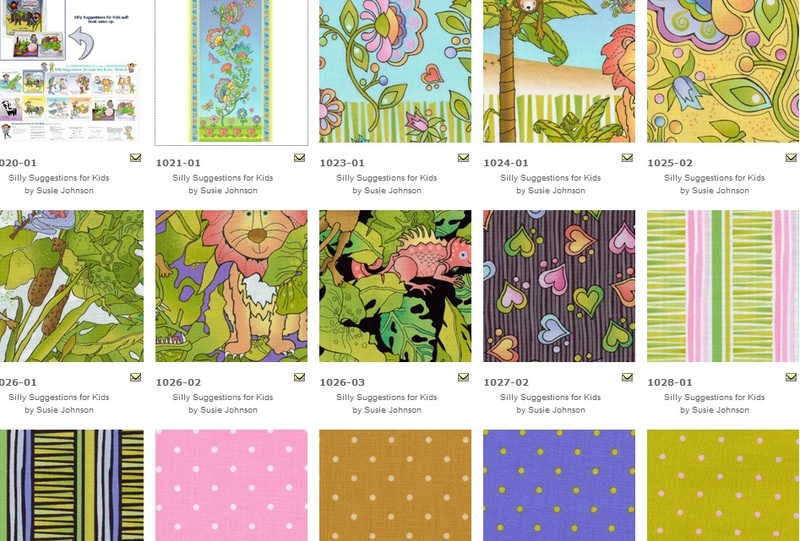 HI Wendy – I would absolutely be interested in a quilt along with a panel — matter of fact — My sister just bought these great panels from Suzybee… Growth Charts — they are awesome. I quilted the Lamb one for her already — and I’m making the Giraffe for my grandson Zachary and the Big Red Bird for us here at he cottage. 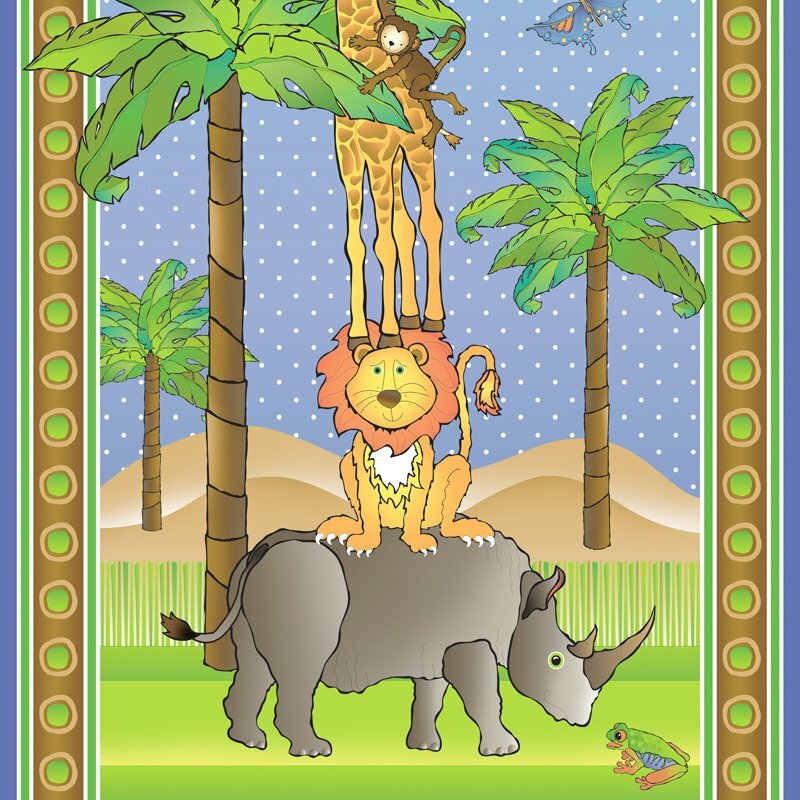 Check them out — so cute and the giraffe has many different ways to quilt it ! Thanks for your continued inspiration — Kay H sent me your way ! I’m sure glad she did. Wow, I absolutely LOVE this! This quilt is so cute! I love making Panel quilts. 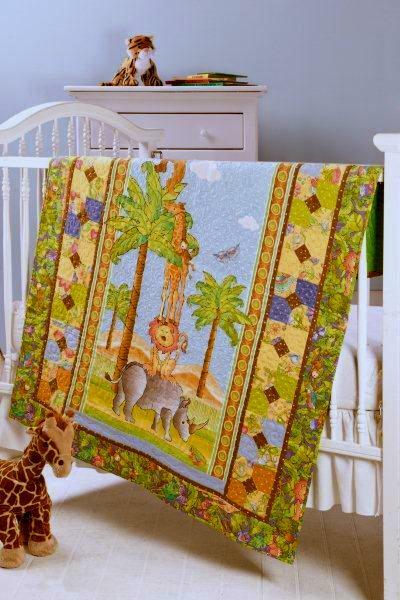 They make adorable baby quilts or wall hanging. I love the fact that I can get a quilt top quickly ready for my free motion quilting practice. I would love to be part of a Quilt Along with Panel. Just courious, did you use different colors of thread for the panel quilt or just one that blended? It depends. I usually like the effect of blending threads with my background color. So, might change colors 2 or 3 times. More than that would drive me crazy. 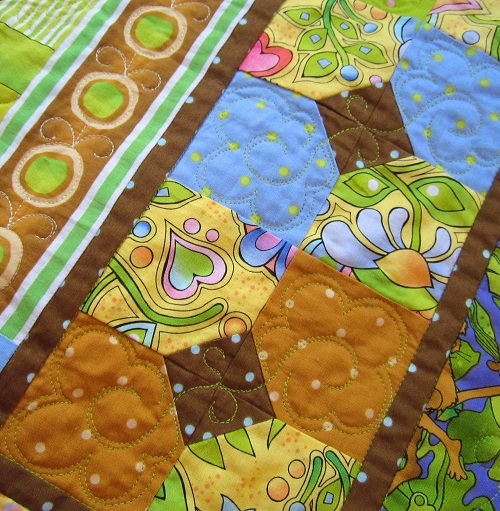 Wendy, your quilting is always so creative!! Love all of it but especially the way you did the Rhino! 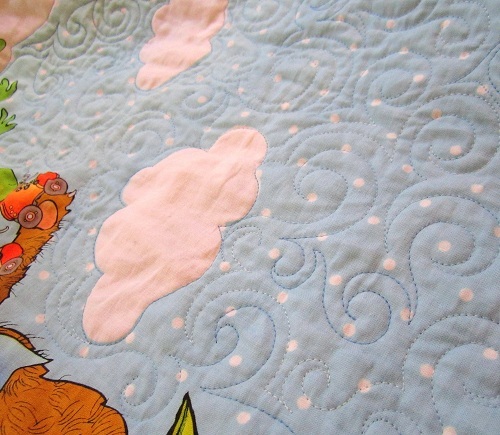 The quilting really makes that quilt, Wendy, you’ve brought it to life! 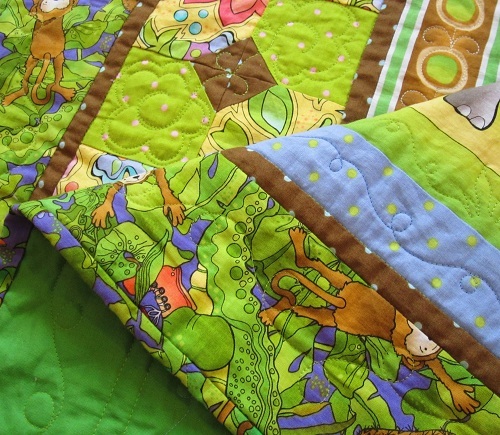 I don’t do panel quilts, although I did when I started quilting – I hand quilted them all. I’d love to be part of a Quilt along with a panel class. I love working with panels! I usually cut them apart and build them back together. I love what you’ve done with yours. The bow ties are great. It’s funny because I was just thinking “bow ties don’t do anything for me!” You’ve changed my mind! 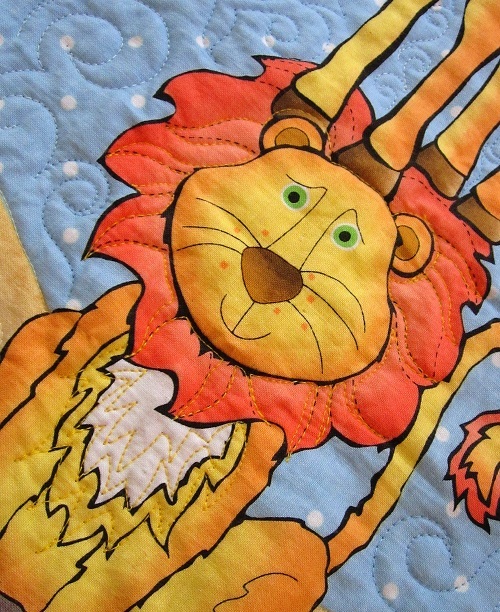 Your quilting is so creative. Of course I would love to participate in a quilt along panel class! Thanks for all your inspiration! I can see why Miss Baby claimed that quilt. That is adorable for children. 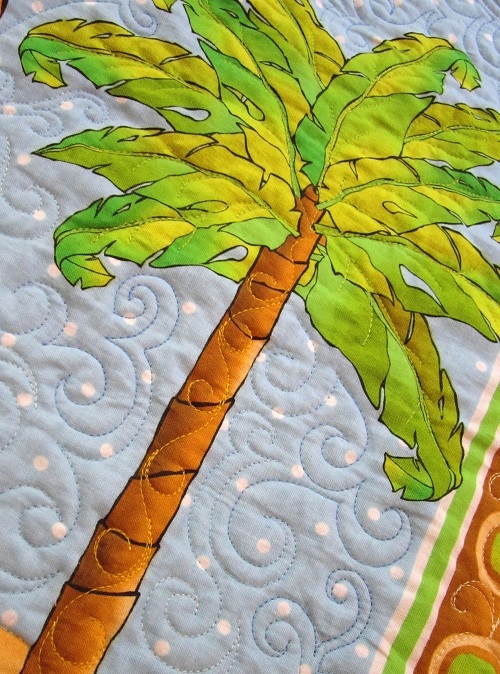 I wasn’t terribly interested in using a panel to make a quilt … until I saw this lovely quilt you’ve done! And now, yes, I would be MOST interested in a panel quilt-a-long. I’m taking my first FMQ class this week and a project like this panel would probably be perfect for me to try various techniques and use my imagination. I love how you did your panel quilt. I just finished one and I love them. Wish I had thought to spice mine up as much as you did on yours! I do think they are great for learning FMQ because you dont have to worry about all the piecing and then working with that. I just got the magazine in the mail today. I love the quilting. I especially like the way you did the border, turning the circles into little flowers. I have done one panel wall hanging but as far as quilting goes, it was lackluster compared to what you have done here. Thanks for sharing. A quilt along would be interesting if you did not go too fast. I have not done too much FMQ. When I started quilting two years ago, I bought two Peter Rabbit panels for two Grandchildren but just sewed a grid on them. They love them and one is so well used it is wearing thin. I used these panels to teach myself how to layer a quilt, use a walking foot, square up and bind. I found it a great help back then and have collected more panels but went on to learning piecing blocks so the panels are still sitting there. Would love to do a quilt-a-long with you as I often ponder those panels but unsure what sort of pieced borders and quilting to use. Thank you for all the advice, inspiration, and encouragement to have a go, as I have now quilted a 44″ x 44″ quilt with feathers, FMQ cross-hatch and that curve quilting in star points and now FMQ two bed quilts with feathers etc and thoroughly enjoying it. Thank you, Wendy. I have a question. Can evrybody do this own panelquiltd or do we have all the same? In germany is it difficult to get a special panel. I would like to do such a quiltalong, I have the one or other panel in my cupboard. Your panelquilt is a very good Inspiration for me. It is beautifull.